The short EMU sat by platform 2 at Cardiff Central. The train to Portsmouth Harbour had departed, leaving the way ahead clear. Its pantograph was up, its doors were open invitingly and it was humming quietly. "Y trên i saith i platfform dau yn awr gwasanaeth deuddeg deugain saith Trênau Duffryn Gwy i Trefynwy Caerdroea, yn garw yn Y Rhath, Llaneirwg, Cas-bach, Casnewydd, Llanwern, Gwndy, Cyffordd Twnnel Hafren, Cil-y-coed, Porthysgewin, Cas-gwent, Tutshill, Tidenham, Netherhope, Shorn Cliff, Abaty Tyndyrn, Tyndyrn, Brockweir, Llaneuddogwy, St Briavels, Nant-Gwyn, Nant-Goch, Wyesham a Trefynwy Caerdroea. Plafform dau yn awr gwasanaeth deuddeg deugain saith Trênau Duffryn Gwy i Trefynwy Caerdroea. Hanu y mynd ar trên, y gofalu y gofu gap gyda a trên ac yn platfform os gwelch yn dda. Netherhope, Shorn Cliff, Brockweir a Nant-Gwyn yn ar savi atalnod cais, yn mae teithiwr gorsaf y rhai hyn ar y trên yn trefnu gofyn gosaf i tocynnwr i trefnu rhwystro i disgyn i trên. The train now standing at Platform two is the 12:47 Wye Valley Rail service to Monmouth Troy, calling at Roath, St Mellons, Castleton, Newport, Llanwern, Undy, Severn Tunnel Junction, Caldicot, Portskewett, Chepstow, Tutshill, Tidenham, Netherhope, Shorn Cliff, Tintern Abbey, Tintern, Brockweir, Llandogo, St Briavels, Whitebrook, Redbrook, Wyesham and Monmouth Troy. Platform two for the 12:47 Wye Valley Rail service to Monmouth Troy. When boarding the train please mind the gap between the train and the platform edge. Netherhope, Shorn Cliff, Brockweir and Whitebrook are request stops and passengers for these stations should ask the conductor on the train to arrange for the train to stop to allow them to alight." Departure was typically punctual; the signal changed to green with a "R" in LEDs above it, the platform person rose a solid tennis racket into the air, the guard closed the doors, various buzzing noises were heard and the train pulled out. A Pacer heading up the Valleys climbed away to the right while the EMU to Monmouth descended to pass underneath it and accelerate out through the terraced houses of the east side of Cardiff. The guard's announcement this time individually listed stations as far as Chepstow. The speed did not last long and soon the train was rolling under a road bridge into the station at Roath. A dozen or so passengers got off, a couple got on and we were under way once more. Looking north across the Wentloog from the South Wales Mainline towards distant Trowbridge, rising up the Rhymney Hill. Terraced houses to the right became fields and occasional industrial units; those to the left became warehouses and then suburban semis. The Rhymney was crossed not long into the journey from Roath and the train enters Old Monmouthshire, but this event passed unannounced - although the flat lands around Cardiff were interrupted by a large hill to the left covered in houses. The train rushed along for a couple of miles, but slowed as it passed a Freightliner terminal. A similar train accelerated past as we came to a stand in St Mellons station, located for the car and convenience for the motorway rather than specifically for locals, at the very eastern edge of the capital. A few shoppers got off and a couple of yobbos with baseball caps and BMXs got on, shoved their bikes in the luggage rack and sat down. They looked like they were heading for Newport, but didn't seem particularly alarming. Within seconds of pulling away we were in the county of Newport and hurtling across the endless Wentloog. Catenary posts flashed by; a Freightliner train headed in the opposite direction; the former station at Marshfield was passed in the blink of an eye. Shortly afterwards the train slowed again and we were drawing into Castleton station, on the western outskirts of Newport. Castleton station attracted a fair few heading into Newport, probably discouraged from using the car by roads unconvinced of the need to upgrade to the internal combustion engine. The railway makes a not entirely appealing arrival into the city - Wales's third - but the train took the endless pointwork under bridge after bridge easily enough and soon we rolled out of a long tunnel into platform 2 of Newport station, with its modern footbridge sitting awkwardly at the western end of a largely traditional station. Newport got a fair pause before the train pulled out, well-loaded with those for the eastern suburbs and the Wye Valley. For the first time an announcement listed all the remaining stations to Monmouth Troy - 19 by this stage - and just had time to get through them as we crossed the River Usk and raced through East Usk yard before the brakes slipped on again and we rolled under the A48 into Llanwern station. Llanwern is a well-used stop in well-used surroundings. Upon departure the train hurried between fields on the north side and the former Llanwern steelworks on the south. Then it swayed slightly away from the fast lines, climbing rapidly. Before anyone could look surprised - most of the locals had of couse seen it before - we were running over the fast lines on a high flyover. Then we descended again and scuttled along the northernmost running line, with the fast lines and the Newport-bound slow line to our right. Another built-up area surrounded us and we slid to a stand in Undy station, carefully designed to reflect the largely 1980s houses surrounding it. It was eventually followed by another spot of open land, but then the railway passed under the M4 and sailed into Severn Tunnel Junction. Something about the large derelict platforms with the filled-in bay says that this used to be a grand place and important junction, but now the clean EMU seemed somewhat out of place and there was a certain lack of bustle. Then the train pulled out and ran east for a very short hop to Caldicot station - a basic station on the edge of a basic estate. 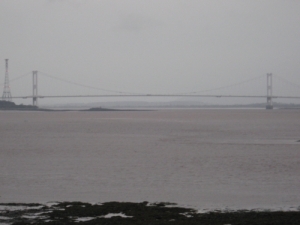 As the train curved out of the station there were some fine views of the New Severn Bridge away to the south, while the huge brick structure in a little village between us and it gave a reminder of the railway's way of crossing the Severn - in a leaky old tunnel. Then the train slowed again and rolled into Portskewett station on one edge of the small village. A few passengers got on and off. The train pulled out and ran briefly through a cutting before revealing some excellent views of the Old Severn Bridge stretching out across Britain's longest river. Electricity pylons gathered on the left as they prepared to make the crossing. Distribution centres with yards stuffed with lorries sat just yards from the line to the left. Then the railway rushed under the Wye Bridge as it carried the M48 from the Welsh shore to the Old Severn Bridge and finally entered the valley after which the train operator was named. The scenery almost instantly becomes more dramatic - running around a large hill and skirting through great rocky cuttings before the line curved above the Port of Chepstow to bring the train into Chepstow station. Chepstow is not an unattractive station, with its nicely-painted footbridge and original building, and before long our doors closed and we pulled out. 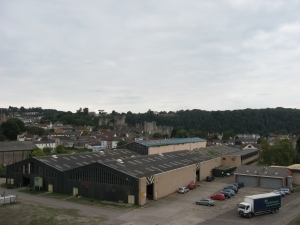 Chepstow, looking north from the A48 bridge towards the castle. Progress out of the station was fairly swift. The train swayed across the Wye alongside the A48 and with fine views of Chepstow Castle. The views were cut off suddenly as the line entered a deep cutting before rolling into a tunnel and emerging in another deep cutting just seconds later - but apparently far from the crowds and next to a small halt with a few waiting passengers. Once the doors had closed the train pulled out again. This was no ordinary departure. As soon as it rolled out of the platform the train slipped to the left, abandoning the double track line towards London and instead climbing swiftly away on a single track branch. We plunged into a cutting within a cutting above the mainline and hurried under a farm track on a bridge surrounded by wild flowers. Then we emerged from the cutting onto a high embankment offering wide views across the surrounding landscape. While the mainline passed under a road we climbed over it and then curved away to the north. The A48 was crossed; a car park lay below to the right. Then the line entered trees and we rolled into the sylvan Tidenham station, a remarkably busy two-platform affair with a new building apparently miles from anywhere which advertised itself as the "Gateway to the Wye Valley". We used platform 2. Platform 1 was occupied by a terminating train due to head back to Cardiff as soon as we left. Then we slipped out of the station. The two lines merged and climbed steeply up a deep cutting. A cyclepath ran at the top of the cutting side. Another path crossed the line from the left by means of a timber footbridge; as we climbed up to the level of the cyclepath it took up the area which would be occupied by the southbound track if there was one. A road passed overhead. Fields ran in an attractive rural England manner on each side. As the cutting narrowed the cycleway slipped away and climbed up the cutting side in its own mini-cutting, rather like our line had climbed away from the junction. A slope and a flight of steps down from it provided access to our next stop - the halt at Netherhope. Netherhope Halt was lightly used - there were no passengers getting on and only one getting off - but it was well-kept, with traditional running-in boards, the distant signal for Tidenham at the south end of the platform and a gradient post at the north end announcing that we were moving from a 1-in-66 rising gradient to a 1-in-90 falling one. This probably explains why it was that our train showed such a good turn of speed as it plunged into the tunnel immediately north of the halt. The tunnel was very dark and produced a strange roaring noise as we hurtled through. After less than a minute we burst out into the sunshine again into a new world. Trees now surrounded us on all sides and the line clung to the hill, with rockfaces rising above us and sheer walls falling away below. The Wye could just be seen glinting through the trees. The train ran through an isolated passing loop and scuttled across a deep valley on a high embankment with a fine view of a long dead quarry. It slowed round the next couple of curves and hooted curiously before reassuring itself and accelerating through a quiet woodland halt. Then we coasted down the long bank towards Tintern. A footpath had been run though the trees below us; a short viaduct provided a little opportunity for a branch to pass safely under the railway and vanish off up the hill. At one point where the path came particularly close a family had stopped to watch us rush by. 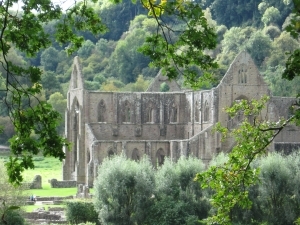 Then Tintern Abbey came into view and the train slowed rapidly for the first stop in the Wye Valley. Through the trees from the bottom end of the proposed platform we see the ruined Abbey. The old branch line to Tintern was now a footpath - and a fairly popular one too, with half-a-dozen or so waiting passengers. Rather more people got off; evidently passengers from Tintern going to Monmouth preferred to use the next stop. With the doors closed we passed the distant signal for Tintern and plunged into a second tunnel. Like the first tunnel had taken us from rural England into something more resembling an Alpine landscape, this second tunnel carried us into a new world where the valley's sides were steep but they didn't seem to be quite so high and the floor was more cultivated. The train instantly swept over the Wye on a bridge shared with a footpath and a miniature railway. Then it was slowing to a very low speed which carried us slowly past another level siding, through the trackwork at the south end of the station and past a couple of parked coaches into the station itself, where another train was sitting in the loop and its driver was leaning out of the cab window to talk to a small boy on the second platform. The station building was open; the gardens were fresh and there were quite a few passengers waiting. Once they were all aboard we pulled out, leaving behind our fellow train, and slipped gently down the hill through the trees towards the valley floor. Then the train ran under a rather fine road bridge and came to a stand at Brockweir Halt, opposite the attractive little village of the same name. With the three waiting passengers aboard we hurried out. The guard put out an announcement listing the remaining stations before Monmouth, but most of the punters now seemed to be locals and they paid it very little attention. Meanwhile we ran between the road and the river atop a narrow wall before rushing across farmland and then slowing for Llandogo. Llandogo produced another three passengers and soon saw us rushing through fields again, leaving behind the attractive village and instead slipping around the hillside into another passing loop. St Briavels only had one platform, but it still had a reasonable turnout and the carpark, located on the former goods yard, had several cars in it. The goods shed was looking tidy. The loop was occupied by an interesting bit of track equipment which was painted bright yellow and had lots of little levers poking out of the floor. The level crossing immediately beyond the station had no barriers but traffic was stopped at nearby traffic lights patiently awaiting our passing. The railway offered some rather fine views of the bridge used by the road to cross the river. Now a path ran just below us on the river bank; someone was cycling along it and put on a short spurt as the train hurried by. 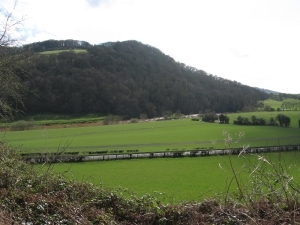 The Wye flowed solidly south; high hills surrounded us with fields to the left and woods on the opposite bank. The train curved away from the river and pressed itself against the hill for a moment before slowing, drawing past a house at reduced speed and then accelerating through the final halt and up the following bank. Trees now dominated both sides of the valley and the railway slipped through spurts of woodland with large gaps providing a clear view across the river. There were a couple of minor occupation crossings and at one point a car could be seen sat amongst the trees below the road on the other side of the valley, looking a little the worse for wear. Redbrook came into view and we slowed for the viaduct, which carried us over the Wye with a hollow rumbling. A slight kink in the track brought us alonside a modern tarmac platform with a simple shelter adjoining a small car park After a very short stop we slid out of the station and passed over the A466 by means of a second level crossing at the north end of the station site. Then we scrambled up a short cutting and hurried along the hillside above the road, staying just ahead of the traffic released from waiting at the level crossing after our passage. The old line from Coleford descended through the trees above us. The view looking west as the train bursts from the trees on the approach to Wyesham. It was just drawing level when the dense forest which we had been running through abruptly ended and the valley widened out into fields. The road hurtled away towards Monmouth, which came into view ahead. The train slipped smoothly around the hillside and rolled along the back of rows of houses which were separated from us by a narrow footpath. The houses then retreated a few feet and were replaced by a platform which looked a little cheap and tacky but did a nice line in pot plants. "Wyesham" said a station sign. The building opened onto a suburban road and was built in brick with timber rendering to help it fit in. The pause was a short one. With the doors closed again we eased around a curve, over the A466 and across a short embankment. Then we rolled onto a high viaduct. Another hollow roar carried us over the Wye, gazing down on the Ross and Monmouth Railway bridge with Monmouth itself in the distance. Progress was slow and easy-going. Cyclists on the old line to Ross had little difficulty staying ahead of us. The viaduct ended and we dropped to their level. A siding marked the line to Ross. We swayed onto it and arrived in Monmouth Troy. Monmouth Troy is an attractive station. It provided all of the facilities which might be expected of a country station; the main building contained toilets, offices and a waiting room with a ticket counter and ticket machine. Leaflet racks contained timetables and information on local attractions. The restaurant block had also been rebuilt and contained a buffet which doubled as a corner shop and thus seemed to be doing a certain amount of local business. Things like drinks and snacks were of course of interest to both locals and tourists. There were a few benches out on the platform, which had been rebuilt to modern standards but was doing its best to appear old-fashioned. The second platform, behind the train, was to traditional Great Western standards, although it had no shelter and there was no way for passengers to get there. The track running through it was evidently only a siding. The west end of the station featured a finely restored tunnel with two tracks running through it. The train remained patiently in the platform and awaited its next turn of duty. 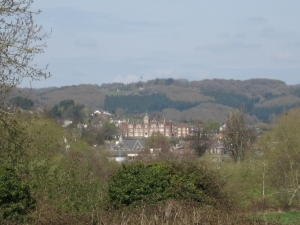 The view from Troy station towards Monmouth itself. The station forecourt was quite large for a rural station, although it had evidently once been bigger and was now squashed in by a housing estate built on the part closer to Monmouth. 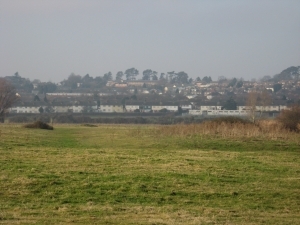 A footpath led around the back of the estate. Signposts to the car park turned out to lead down a path which dropped down the north side of the Ross and Monmouth embankment, ran under the two railways and then entered a narrow strip of land given over to a pay and display car park built on part of a field adjoining the south side of the station. Another path led up to the road over the tunnel portal. The walk round to the former Monmouth May Hill station on the old railway trackbed to Monmouth made for an attractive stroll, although the fact that it was necessary to cross back over the Wye to find a Monmouth hotel (apart from the May Hill pub) rather highlighted that the railway could do with a more convenient Monmouth terminus.